everything looks as expected, if not better for the price. i would have been completely satisfied except that the tip of my blade looks like it was grinded off. thats right, i have a dagger with a completely square tip. The only complaint I have is the same complaint I have with three of the sword canes I have bought... it rattles when you use it as a cane. Add a little thread tape and it's perfect. Great cane sword. Good weight to it and very solid. One of the better sword canes obtained from you, but not perfect. Expected the dull blade. Did not expect to need a washer to keep the handle from coming loose whenever walking with it. I also needed to grind down the weld joints on the collar. Still looks tacky. This cane is surprisingly amazing. If you see the reviews for any other cane sword for $20, they're all low quality blades. This one, however, is the best for the price. Solid, feels good in your hands. Only complaints are that A.) Blade/point are kinda dull and B.) It's kinda noticeable if you're getting mugged and you start loudly unscrewing your cane. But, again, $20! Get this. I recently recieved my cane sword from trueswords and was very pleased. I made this purchase for a family member as a christmas gift. One of the few times ive ever ordered, well, anything and been completely satisfied from beginning to end. Product was better then advertised, shipping was fast, and was handled with care. A big thanks to a company with standards! At my theatre we performed Dr. Jekyll and Mr. Hyde, I was Hyde. 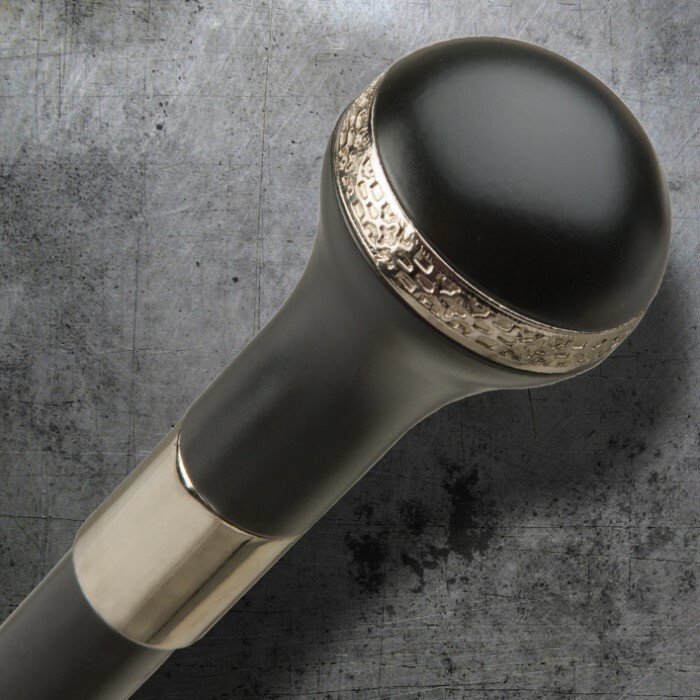 I showed my director a ton of different sword canes and he said "Why don't we try this cane" from the looks I thought this cane wasn't the best choice... Then it came in the mail. It was so sharp I could have easily been killed in the last scene, so we dimmed it down. I hate to admit this but, I dropped the cane plenty of times and it held up very well regardless. This cane is very durable and fairly light I would highly recommend this blade... especially if it can last an entire show process. First--this IS a cane. you would have to be well over 300 lbs before you had to worry about it not supporting you. Second-technically it is a "dagger" cane but they tell you in the ad the blade is just over 12 inches. Third-it IS stylish and good looking-better by far then price would suggest. Two concerns with the cane- Not problems. 1. due to Natural flexing of the cane in use a slight clinking sound can be heard as you walk using it for support---Easily taken care of. I carefully-using the blade-pushed some paper towel down into the cane. This quieted the clinking. And only reason it is a concern is that if you use it in places where needing a cane is thought a sign of weakness-the noise might give away that it was Not what it appeared. In street confrontations surprise is necessary so you would be giving away your advantage. Don't get me wrong-this is Not the weapon to use on a street fighter but against lesser attackers it could save your life. Also id use cane and dagger together. Cane is sturdy enough to fend off blows or smaller impact weapons. The dagger is your follow up. Also even before you get the dagger out-the cane itself doubles as a hefty cudgel. The head is simple-ornate but also heavy. someone getting rap from it-either on head or nerve points-is gonna hurt. 2nd concern--the tip. I use a cane as an aid. 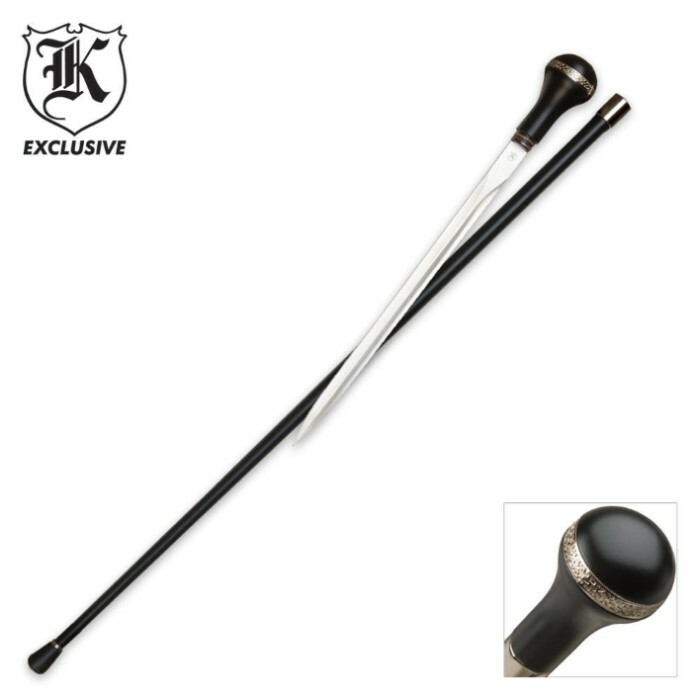 This is not standard cane size and you would have to find special tip--HOWEVER- a bit of duct or athletic tip-wrapped around the Bare tip will fatten it so a 5/8 in cane tip will fit. Be careful how you put on the tape and you will Not spoil the looks. And it is a looker-very nice. If I weren't concerned that someone in security might find the blade-I would not hesitate to take this to a state dinner. WELL worth the price and-as usual- freaky shipping arrival. Trueswords has a repeat customer. And to prove it see my Bloodrayne and Spartan sword reviews--thanx for reading/hope it helps.